Two acts, to be precise, both involving flowers. One I suspect most people are already aware of, and involves sculpted flowers, the other involves live flowers and currently hasn’t had much publicity. 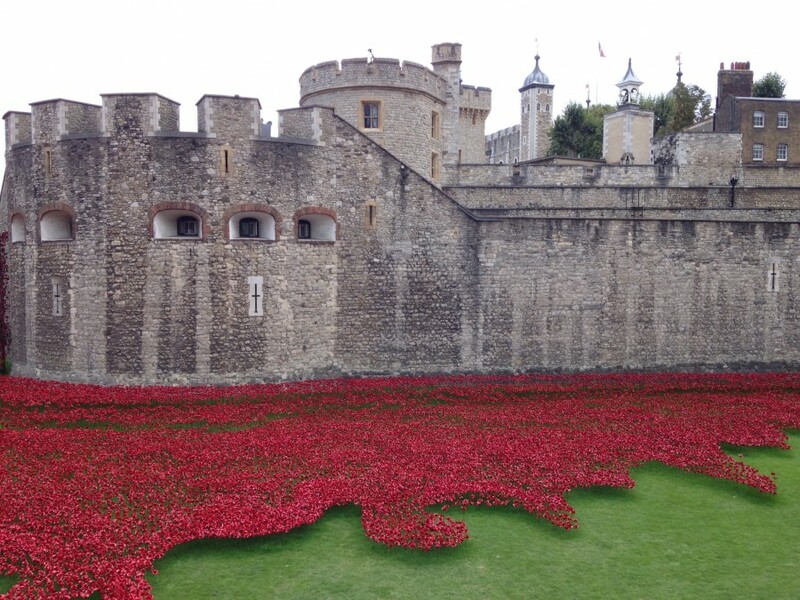 I’ll start with the poppies at the tower or “Blood Swept Lands and Seas of Red” to give the art installation its proper title. 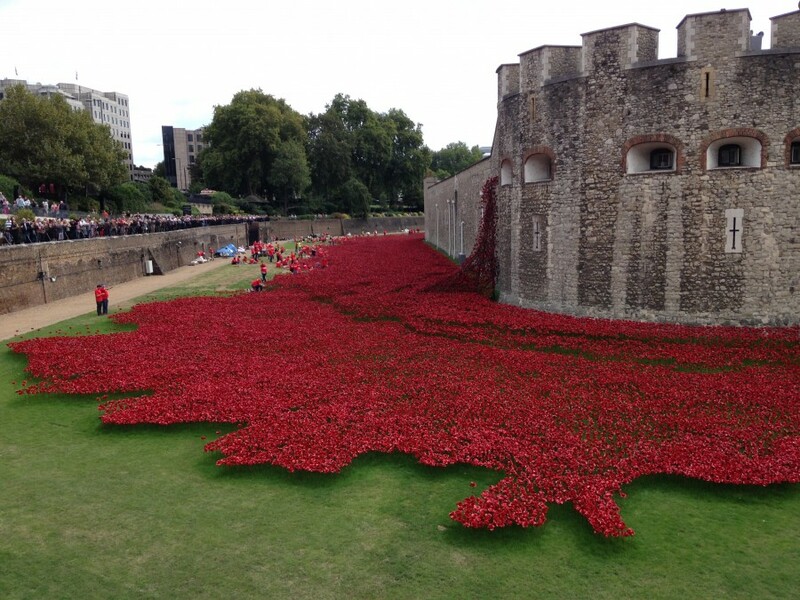 The brain child of artist Paul Cummins, this is one of the most vividly striking acts of remembrance of the centenary so far; huge swathes of scarlet surrounding one of Britain’s most iconic buildings, just begging to be photographed. It’s also one of the most poignant; each hand-crafted ceramic poppy representing one of the British military fatalities suffered during the course of the war. When the final poppy is put in place there will be 888,246 of them, filling the moat of the Tower and providing a deeply unsettling, yet hauntingly beautiful, reminder of one of the costs of the conflict. If you are there at dusk you will also be able to put some names to those being remembered, as a roll call of 180 names each night is read, followed by the sounding of the last post. The photos below are from my visit, back in August, when they were only half way through the planting, yet the sight was enough to bring a lump to my throat. What it was the people around me and the conversations I heard that really made the experience special; discussions about the war itself, the whys and wherefores, what it was these deaths were for, as well as hearing families discuss relatives who fought, listening as memories were shared, some for the first time, that brought to life a time which is rapidly passing from living memory. 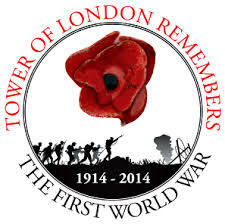 The first poppy was planted at the tower on 4th August 2014, the centenary of Britain’s entrance into the war, and the last poppy will be placed on 11th November 2014 at 11am precisely. After that each poppy will be taken up, cleaned, packaged and sent out to the people who have ordered them (sadly all have been purchased, so it is no longer possible to own a small piece of this wonderful artwork). I will be returning to see the display again before they begin to gather the poppies up and if you are in London between now and 11th November, I do urge you to try and find a few minutes to go and see them. You don’t have to pay to get in the Tower (although they have an exhibition inside as to the role of the building during WWI if you do), you can just walk the perimeter, take in the atmosphere and reflect on those being commemorated. The Arboretum is already a living memorial, the planting of the first trees in 1997 began the landscaping of 150 acres of the Staffordshire countryside. 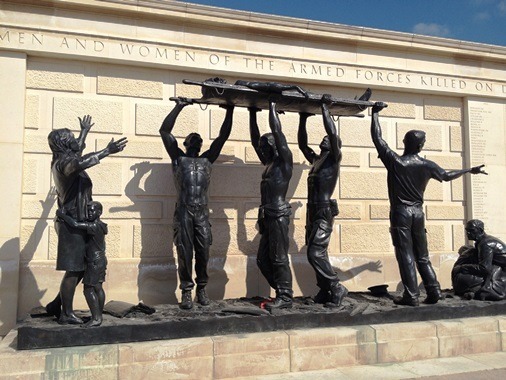 First conceived of by Commander David Childs CBE, the idea was to provide a central point for this country to honour the personal sacrifices made by both the Armed Forces and the civil services of the United Kingdom, a place of peace and beauty where anyone could come to remember and reflect upon those who have made the ultimate sacrifice. There are no graves on the site, instead it houses 50,000 trees and has more than 200 memorials, each one dedicated to a different group or event, many of which are not military related, and the number is increasing all the time (the wall commemorating the 453 military personnel who died in the course of the Afghanistan conflict that was, until this week, in Camp Bastion is being moved to the Arboretum for permanent display). 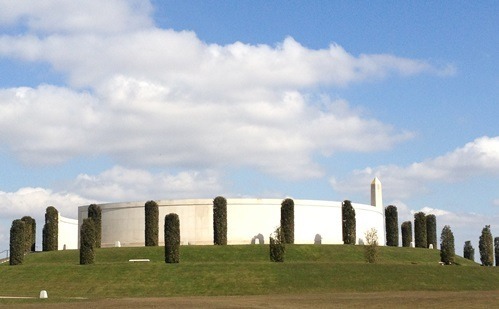 It is unlike any other memorial space in the country and I count myself extremely lucky to live less than an hour away. The Arboretum hosts commemorative events all the time but, for the centenary of WWI, as well as having services they wanted something a bit longer lasting. What they decided upon is, I think, perfect. Two of the memorials which relate to events of WWI are section of woodland – the Merchant Navy Convoy Wood and the Ulster Wood – and it is there that during the course of last weekend and this weekend, over 15,000 bulbs are being planted. This will ensure that next spring, and every spring that follows, the ground under the trees will be carpeted in English bluebells. The bluebell is a symbol of everlasting love, humility, gratitude and constancy and will act as a reminder of World War I. High Wood; the last of the major woods in the Somme to be captured by the British is the resting place of around 8,000 British and German soldiers and still springs with bluebells every year. The sea of 15,000 blue bells will enhance the beauty of the Arboretum, encourage a variety of wildlife to our grounds and ensure that we remain the special place where our Nation remembers. Volunteers started planting the bulbs last weekend (I had hoped to be one of them but an unwelcome migraine spoilt my plans) and will finish this weekend. I shall, instead, content myself with a visit next spring, to see the results of the labours.